Linda Patten Hales, 66, of Pleasant Grove passed away August 26, 2018 in American Fork, Utah after her valiant battle with cancer. She was born February 27, 1952 in Payson, Utah to William and Norma Thatcher Patten. Linda married her sweetheart Mark D. Hales May 31, 1973 in the Salt Lake City Temple where they were sealed for time and all eternity. Linda was a faithful and loving member of the Church of Jesus Christ of Latter-day Saints, where she served in many callings including Relief Society President, Young Women’s Leader, Primary Teacher, Cub Scout Leader, just to name a few. She loved to sew, make crafts, quilt and often shared her treasures with others. Linda especially loved being a Mom, Grandmother, and Great Grandmother. She was proud to say her greatest accomplishment in life was being a mother to her three children. Linda was a treasured member of the Pleasant Grove Fire Ladies Auxiliary and the Utah State Fire Ladies Auxiliary where she served in many capacities including President. Her association with these Auxiliary’s provided her an expanded sisterhood and she cherished all of the relationships she built and the people she met through running the Fireman’s Breakfast for 35 years. 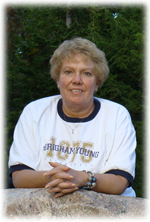 Linda was an avid Brigham Young University fan (football and basketball), and loved watching the games and cheering them on with her family. At the heart of her life, you would always find Linda serving others and she found great peace and purpose in putting others before herself. Linda is survived by her sweetheart of 45 years, Mark D. Hales, and her three children: Tammy (Kevin) Storey of Pleasant Grove; Eddie (Nichole) Hales of American Fork; and Danny (Erin) Hales of Saratoga Springs. She is also survived by her six grandchildren Kyler Johnston, Brooklynn Witney, Bradon Hales, Emilee Henriquez, Mason and Hudson Hales, and her two great grandchildren Liam and Ollie Witney, her brother’s and sister’s: Peggy (Mark) Burdett of Provo, Janice Ivie of Orem, Dennis (Joyce) Patten of Orem, Phil (Ronelle) Patten of Orem, and Steve (Diane) Patten of Lindon. She was preceded in death by her mother and father William and Norma Patten, In-Laws Clifford and Dora Hales, a brother Ricky Patten, Brother-in-Law James “Jim” Ivie, and Sister-in-Law Patricia Hales. Funeral services will be held Friday, August 31, 2018 at 11:00 am in the Timpanogos Stake Center, 800 North 100 West, Pleasant Grove. Family and friends may attend a viewing Thursday evening from 6-8 pm at Olpin Family Mortuary, 494 South 300 East, Pleasant Grove and at the church on Friday from 9:30-10:45 am prior to services. Interment will be in the Pleasant Grove Cemetery. Condolences may be sent to the family at www.olpinmortuary.com. The family would like to extend a special thanks to Dr. Brandt Esplin and his staff at Revere Health Oncology and Intermountain American Fork Hospital for their loving care. We also extend a special message of gratitude to the Firefighters’ of American Fork, Lehi, and Pleasant Grove for the unwavering love and generosity they have continually provided Linda, Mark, and the entire Hales family.